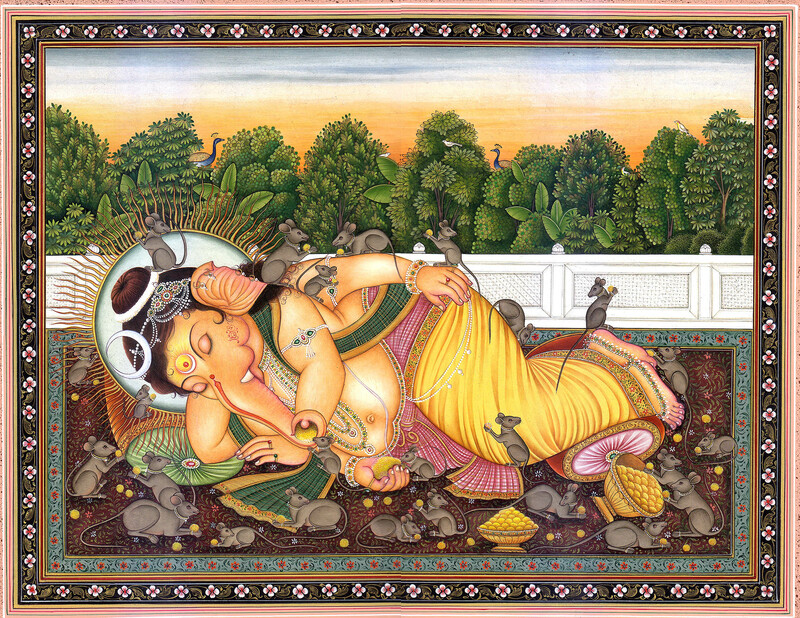 This brilliant and highly fanciful image of the four-armed Lord Ganesh, exceptionally pleasant, delightful and abounding in great magnificence and majesty, represents him in highly intimate moments of leisure reclining in full ease and completely tension-free with a child’s innocence on his face like a chieftain resting on an autumn evening after his day-long business. He is sleeping in full ease on a carpeted terrace with beautiful marble railing separating it from a thick lush green garden, which a wide range of trees including various species of Sapta-parni and plantain as also a number of birds including peacock perching on them define, leaving his most loved possession – his ‘laddus’, at the disposal of the fraternity of his mount mouse to eat and enjoy. He is lying down right-facing supported on his right arm which has under it a large bolster. 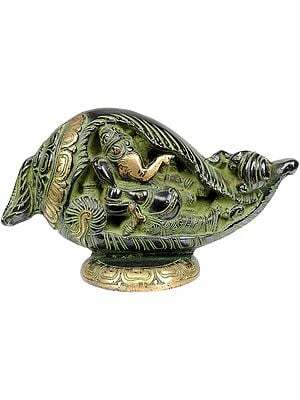 There is another bolster, smaller in size, towards his feet. He has his legs and feet supported on it as one does for relief when tired. 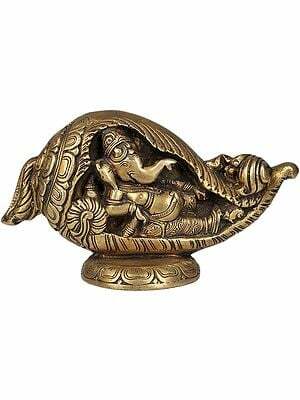 Strangely, he does not carry or has around him any of his regular attributes except a large size ‘laddu’ in his normal right hand, and another, in his trunk, and those too two mischievous mice are stealing away. The artist has dramatized his figure a little by mounting his one leg on the other and by juxtapositional placing of the lower right hand and the upper left. While an elaborate halo with gold-rays radiating from it defines his divinity his face reflects his inner bliss, absolute contentment and complete ease. There reigns on his face a benign sublimity, great composure and an absolutely relaxed mood. He does not have even his mount around there, though the compassionate Lord has generously allowed as many as twenty-five of them, the naughty ones as they are, to steal away his most loved ‘laddus’, eat and scatter them around, and to mount on his body, freely roam over there and sport. Fearless they are dashing to and fro and two of them dare steal ‘laddus’ direct from his hand and even trunk. As if brought for them, ‘laddus’ are stored not only in two large trays but also lie scattered all around to let them find them easily and everywhere. The artist has created with master strokes of brush an enormously interesting anatomy of the elephant god. Squeezed from both sides his pot-belly has further protruded, though a gold-laced deep green sash, a gems-studded delicate girdle and waistband and necklaces descending down the belly conceal its volume and attribute to it a different kind of beauty. The curves of legs, ascending hip-part and the left arm mounting on it and the rest of the figure create a rare sense of rhythm. Like his posture his ornamentation too is highly balanced, especially the large lotus used for adorning and balancing the left side of his hair with his knotted coiffure on the top and the right arm on the other side. 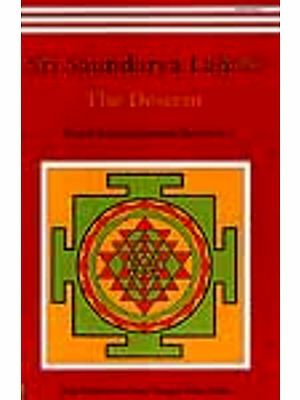 He is wearing a few but elegant ornaments, one adorning his hair and those on his feet being of special interest, his father’s crescent, the usual 'yajnopavit' and a beautiful ‘bindi’ on the forehead. Save a 'dhoti' and a waistband he has no other costume on his person but in its deep golden yellow and elegant border and in its delicate ripples even this simple ‘dhoti’ has a majestic look.